﻿ The Guyver Archive / What is the Guyver? Just what is the Guyver? The Guyver is a creative work by the manga artist Yoshiki Takaya. It entails the story of one young man, Sho Fukamachi, and his sudden involvement with a company called the Kronos Corporation. Sho came upon an alien device, and merged with it, becoming a creature know as The Guyver, with superhuman abilities. Sho then wages a war against the Kronos Corporation, and its shapechanging soldiers, called Zoanoids. What mediums is the Guyver on? Originally, The Guyver was a manga, or Japanese comic. It was later turned into a animated series, with twelve volumes. 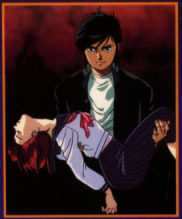 However, since The Guyver was never very popular in Japan, the animated series was cut. Has there been any activity of The Guyver in the United States? Yes. The animated series was originally released as six tapes, by U.S. Renditions. It was later released by Manga Video as a series of twelve tapes. The manga has also been translated into English, and is currently available by Viz Comics. In addition, two live-action movies were made, both in english. The first movie starred Mark Hamill (Star Wars, Wing Commander III), and Jimmy Walker (Good Times). Originally made for, and released to, Japanese audiences, it found its way to the U.S., released by New Line Home Video. However, despite its $10 million price tag, it still appeared to be low-budget, and was, in some small parts, a comedy. The second movie didn't have any brand-name actors, and even with its smaller budget ($2 million), it used computer generated effects for weapons, and the Guyver transformation sequences. On the down side, the movie was much too Power Ranger-ish, with lots of hand and foot play, which is not traditional Guyver battling. Just what is this archive all about? This archive is meant to be a source for Guyver related fanfiction, or fan writing. Fanfiction takes various subjects and characters, and turns them into stories that would not normally be seen, or allowed, in the licensed public.